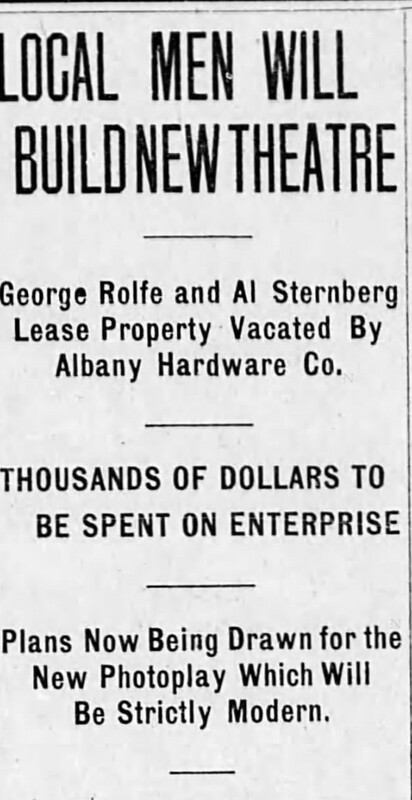 January 1913: T.G Bligh and George E. Rolfe go into business and lease the property formally rented by the Albany Hardware Co. This theater would be called the Rolfe theatre before receiving a name change in 1920 to fit its “Egyptian-esque” detailing. 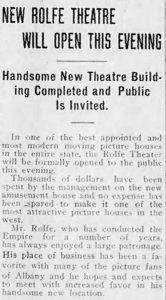 June 1913: The Rolfe Theatre, a new “amusement house” in Albany, opened its doors to the public on June 3. Located at 219 W. 1st St, the theatre remained a prominent attraction within the community and continued to operate under this name until 1920. No stranger to the industry, George E. Rolfe spared no expense in an effort to create an attractive venue that would surely connect with the people of Albany, Oregon. January 1914: There were two theatres in Albany, Oregon, the Globe Theatre and Rolfe Theatre. Both were under the same ownership and often worked together in order to continue their success within their respected community. In an article published by the Albany Daily Democrat, it is mentioned that managers for both the Globe Theatre and Rolfe Theatre, C.F. Hill and E. L. Hudson, collaborated in order to eliminate the loges within the Globe Theatre. They will be removed while two rows from are being brought back from the front of the house and placed in their stead. 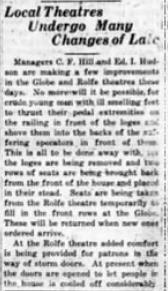 Seats were also temporarily taken from the Rolfe Theatre to fill the front roles at the Globe Theatre, which were then scheduled to be returned when the new ones ordered arrived. It is also mentioned that the Rolfe Theatre is adding storm doors in an effort to increase the comfort of customers. Other changes include a change to the name. Please refer to the Rameseum Theatre Theatre. 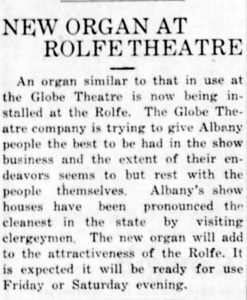 March 1920: Prior to re-branding, the Rolfe Theatre installed a new organ, similar to the one used at the Globe Theatre. The new organ was expected to be ready for use by Friday or Saturday of that week, adding to the already impressive nature of the theatre. The article also notes that both the Rolfe and Globe were declared the cleanest show houses in the state of Oregon by visiting clergymen. The Rolfe Theatre provided a variety of entertainment, ranging from international acts of comedy to American driven films. 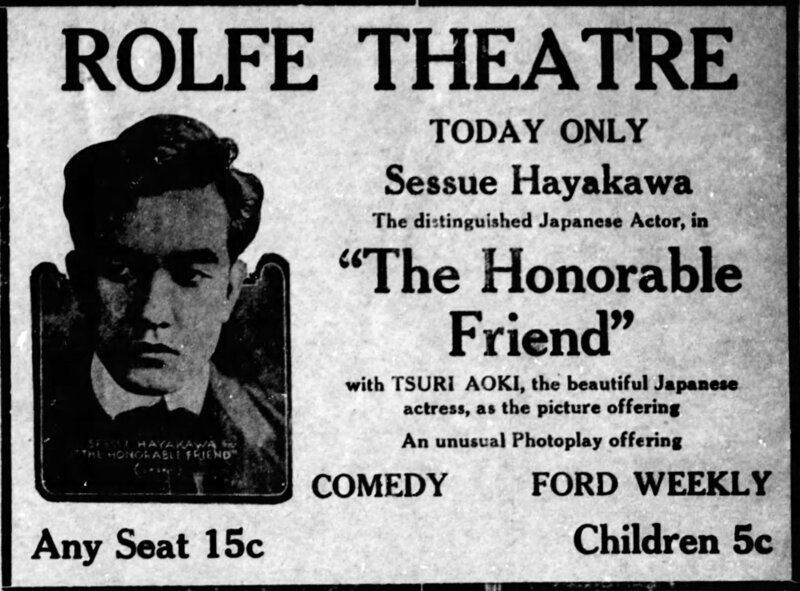 To the left is an advertisement for an comedic show titled The Honorable Friend, starring Japanese actor Sessue Hayakawa who is accompanied by Japanese actress Tsuri Aoki. 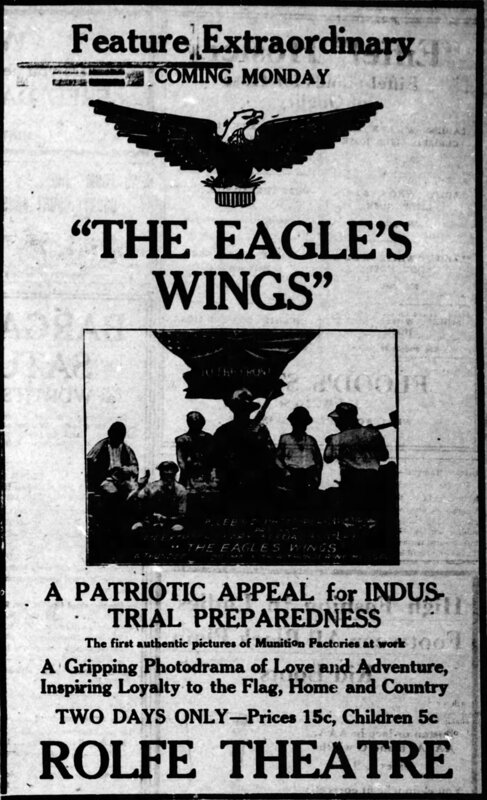 The advertisement to the right is for a film titled The Eagles Wings, described as “A Gripping Photodrama of Love and Adventure, Inspiring Loyalty to the Flag, Home, and Country”. The differences in advertisement techniques is a direct correlation of the entertainment presented, with one advertisement presenting an entertainers name while the other is geared towards the American spirit, done so during World War I.
August 1920: The Rolfe Theatre, operating under this name for the past seven years, is in the midst of a renovation and was remodeled along Egyptian lines. 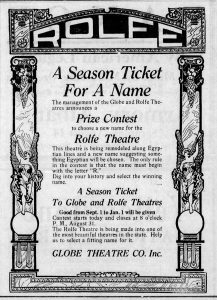 In need of a new name to coincide with its new identity, the managers of both the Rolfe Theatre and Globe Theatre held a contest in order to determine the theatre’s new name. The contest runs through the end of August, with the only rule being that the recommended name must start with the letter “R”. 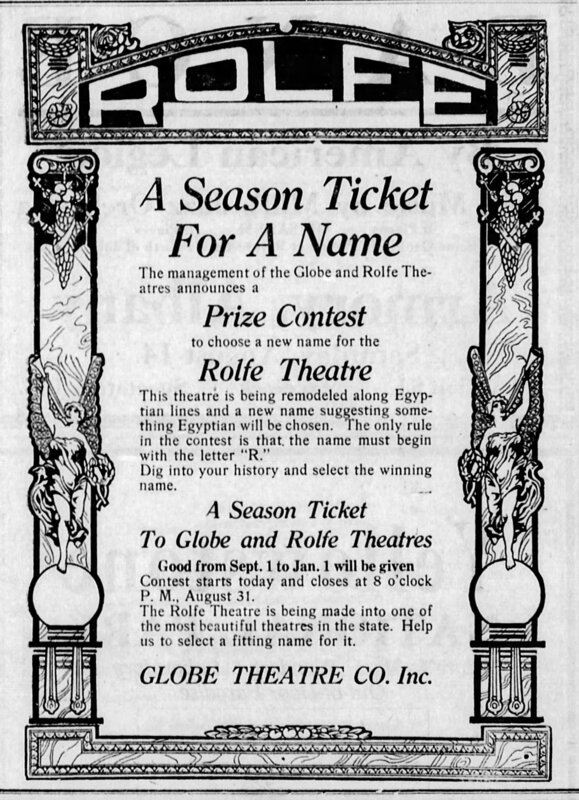 A strategic promotional ploy, the contest not only generated buzz but provided individuals with an incentive, the opportunity to win a season ticket to both theatres, which is good from September 1- January 1.The advertisement itself continues to highlight the connection between the Rolfe Theatre and the Globe, both under the same ownership. Rolfe Theatre, advertisement, Albany Daily Democrat, January 10, 1913: 7. 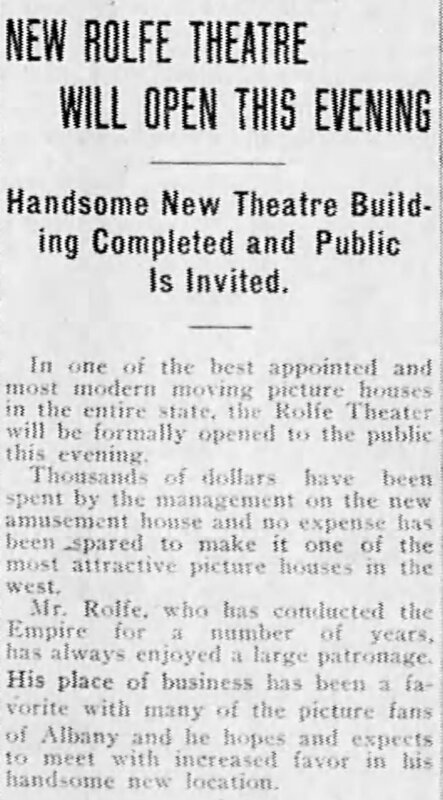 “New Rolfe Theatre Will Open This Evening,” Albany Daily Democrat, June 3, 1913: 3. “Local Theatres Undergo Many Changes of Late,” Albany Daily Democrat, January 14, 1920: 4. 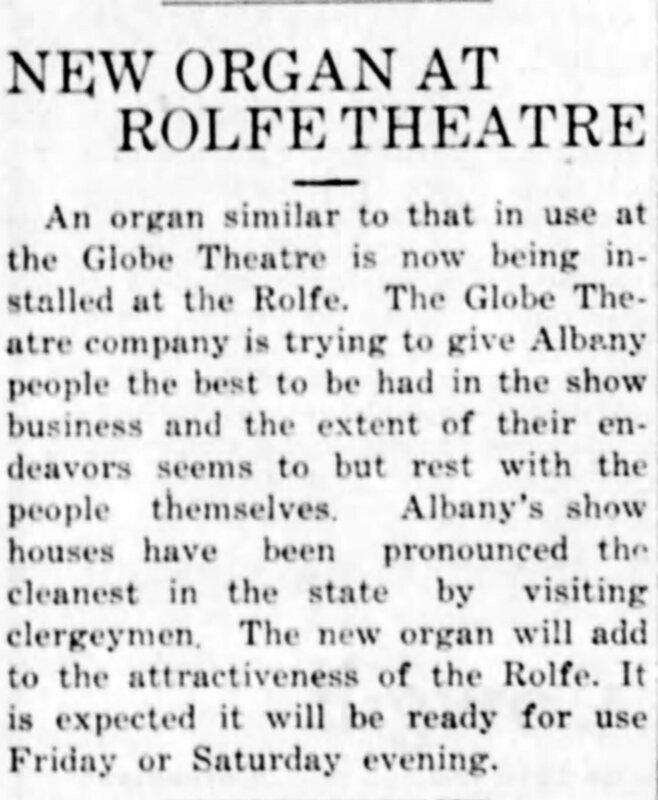 “New Organ at Rolfe Theatre,” Albany Daily Democrat, March 4, 1920: 1. 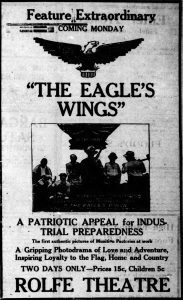 Rolfe Theatre, advertisement, Albany Daily Democrat, January 25, 1917: 3. 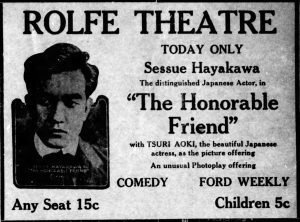 Rolfe Theatre, advertisement, Albany Daily Democrat, August 14, 1920: 5.